MINNEAPOLIS – Jack Salt, Virginia’s lone senior, sort of melted into the moment. He sat soft spoken at the end of a career with a net cord tied around his cap and seemed to understand the enormity of his final time in a Cavalier uniform. The Hoos captured the program’s first National Championship with an 85-77 overtime win against Texas Tech, which also doubled as probably the most significant moment in UVA athletics history. That journey had been 10 years in the making. For a program inherited by Tony Bennett and transformed from afterthought to champion, the memories in Minneapolis will be talked about through generations of Wahoos. Salt, the selfless and steady team leader, lived in the center of it all for half of the journey with 5 years at Virginia. And in that moment surrounded by reporters, he wasn’t crestfallen or jubilant. More like immersed in appreciation. Soaking everything in as a champion for life. Salt’s teammates always appreciated the warrior spirit he brought to the floor, sacrificing his body and his role for the greater good. The teams with Salt in an active role compiled a 118-25 record at Virginia. His time included back-to-back ACC Regular Season Championships, an ACC Tournament title, and the National Championship crown at the end. His teammates couldn’t help but smile at the final chapter in Salt’s long career. For a heart-stopping moment, it looked like Virginia’s luck finally had run out. Shortly after De’Andre Hunter drained a 3-pointer to tie the game in the final 12 seconds, the Cavaliers got the defensive stop they needed to force overtime. At least for a split second, they did. 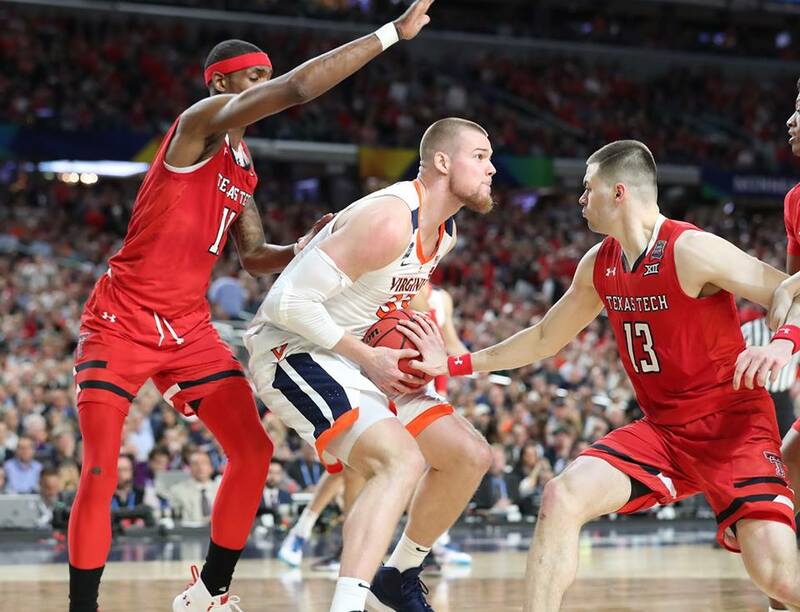 When Hunter came down with the defensive rebound, he tried to shuffle the ball quickly to Kyle Guy as around four seconds remained. Guy, unfortunately, had spun to the referee to call a timeout. The pass rolled agonizingly slow to the sideline and out of bounds. Texas Tech would have the ball with 1.0 second left to try to win it. That’s close to the same remaining time in a similar spot on the floor that the Hoos used an inbounds play to eventually win on Saturday. Had the miracle-working finishes against Purdue and Auburn finally lost the magic? Not if Virginia’s defense could meet the challenge one more time. That left Braxton Key with the responsibility of mirroring Tech star Jarrett Culver, the likely shot recipient on the play. Culver caught the ball toward the corner, turned, and lifted a shot attempt with the game on the line. But Key met him at the apex and blocked the ball way. Crisis averted. Key played a huge role in the title victory. He played 29 minutes and produced 6 points, game-high 10 rebounds, 2 assists, and that critical blocked shot. He also gave the Hoos the ability to switch some things on defense to help contain a smaller lineup that Texas Tech put on the floor. He even spent other time defending Culver when Hunter didn’t have the assignment. All of that, of course, came in the national title game. The build-up to the big day was challenging. Key talked about a restless night after the game on Monday. UVA’s Mamadi Diakite really rose to the occasion in the NCAA Tournament, stringing together six consistent games with a ton of minutes to help the Hoos finally reach the pinnacle of college basketball. Over the six-game run to the title, Diakite played 25 minutes or more in each game. He had 6 rebounds or more in all six games, scored 7 or more points five times, blocked 2 shots or more five times, and stayed out of foul trouble with 3 fouls or fewer in all six games. The averages worked out to 10.5 points, 8.2 rebounds, and 2.7 blocked shots in 32.2 minutes. He shot 60% (27 of 45) too. All of those surpassed his season averages. Diakite’s high school coach at the Blue Ridge School, Cade Lemcke, took in the games on the road to championship. Lemcke played for the Hoos for two seasons in 1998-2000. Diakite said it was great to have Lemcke at the games that secured the National Championship. Sophomore Jay Huff on the fact that three different players – Mamadi Diakite, Kyle Guy, and De’Andre Hunter – made big shots to help win the last three games in the tournament: “It speaks again to the fact that we have guys that can get hot on any given night and we have plenty guys that can make plays at the end of games.”. Virginia Athletics announced a championship celebration for the team, which will be held at Scott Stadium on Saturday at 2 p.m. The West and Southwest Gates at Scott Stadium will be used for entry beginning at 12:30 p.m. The program will begin at 2 p.m. Parking is free on a first come, first serve basis in the Scott Stadium lots. Admission event is free. The clear bag policy and entry procedures will be used on Saturday. So very proud of these guys and the B-ball staff and coaches. To a person, they represent the best of the University I’ve loved since I visited the grounds as an 8 year old in 1961 and continued to my graduation at U Hall in 1975. It was the only school I applied to or could have ever been satisfied to attend. Selected with that honor in early decision in November of 1969, my father was around to be proud of my achievement, although he passed away the following March, five months before I walked into Kent Dormitory my first day of orientation about as afraid as I’d ever been in my life. With very few resources, a widowed mother to support and some money there and again from my three brothers and an uncle Bill Layman, I put myself through school mostly on my own with one year off to gather some cash and get my head together. And now, that Diploma with that blue & orange ribbon in the corner is my most precious and proud possession. I hope every one of these young men have in their hearts the same love I feel of this place, now in triumph and for years to come as they graduate, marry and raise their families. GO HOOS! Kris thank you for outstanding coverage and insight throughout the season and this incredible run. Could not have been better!